– Coverage was about the suggested 50 sq. per gallon for the two coats. We used 12 gallons for the deck at a total cost of about $400 for 600 sq. feet. – There was some mold on the deck. Very little and could be related to a large tree nearby. Nothing to worry about and the Olympic Rescue It did a pretty good job with this category. – The Olympic Rescue It did not darken in color in any way. 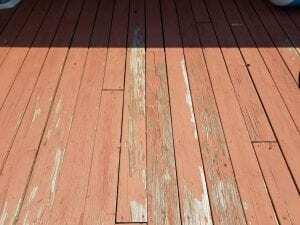 – You would have to sand off the Olympic Rescue It for full removal before reapplying the same or a different brand of deck stain. – The Olympic Rescue It scored better than any other of the big box versions of the “Deck Resurface” type stains. If you are in a warm weather state, you probably would get better results then our testing. These products seem to peel anywhere you get a freeze/thaw cycle. I first used this about 5 years ago. I was very pleased with the appearance and the performance of the product and continued to repurchase it at Lowes. Yesterday, I went to Lowes to make another purchase for my “new” house as I recently relocated …. only to find they no longer carry it. I was sorely disappointed. I will attempt to find it elsewhere even though I have to drive about 60 miles to get it. It is good stuff !! Terrible product. Didn’t last one year before it started to come up. Made my deck look horrible. I would never recommend this product. You will need to sand this off fully to prep for a better stain. Now i was getting ready for maintence tjis year and my wood where the sun shines is broken open and rotted in places. It is to hot yo even walk in before noon. I will have yo replace my whole deck and i am unemployed and my husband on disability. I am disgusted yo say the least. Here are pictures if my once beautiful deck. Olympic products before and was satisfied with results but Rescue It has not been one of them. The stain left by the fallen leaves is very unattractive and must be remedied. I expect to receive an answer to this e-mail and complete satisfaction as soon as possible. Thank you for your consideration and timely resolution. Hattie, best to contact Olympic directly with your issues as this is a review site for all deck stain products and not related to Olympic in any way. Used Olympic Rescue It on deck. Good surface where covered but peeling badly where open. Lasted one winter. Purchased at Lowe’s and they will not offer any refund or rebate. Put in car trailer and did not last one year. Completely gone. Spent almost $500 on 3 five gallon buckets.. for nothing. How can this product remain on the market with all of the complaints against it. Olympia CEO needs to put this on his deck for a first hand look at what garbage it is. This the worst product I have ever used. Applied in spring 2015 and by the next summer 2016, it peeled off in sheets. Here we are June 2017 and we can’t get the reminance off. We could bomb it and it wouldn’t come off in spots. Yes we did prime it and it was sanded. Never again. Contact the company there was a class action suit on the Olympic Rescue It wood and Concrete resurfacer. Not sure if you can still get in on it. Overall the product has performed as expected. BUT, THERE SHOULD BE A WARNING ON THE CONTAINER THAT IT GETS VERY, VERY HOT IN DIRECT SUNSHINE!!!!!! The container says it is :BAREFOOT FRIENDLY”. IT IS NOT!! IT WILL ABSOLUTELY BURN THE BOTTOM OF YOUR BARE FEET. I have to put rug runners on my deck and you can feel the heat coming thru them. I would not have bought this product except it said it was barefoot friendly. I want to know if there is something I can paint over it to stop the heat, PLEASE, ANYBODY, email me if there is. I will not buy another product like this from lowes or anywhere else. I think I’ll join the lawsuit. 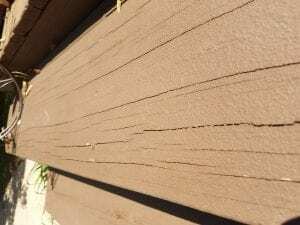 Has anybody had problems with Olympic Restore It rotting your deck boards? My entire deck peeled , when I contacted the company about the problem, they just me paper work to get more of the stain and to follow the instructions just as I did beore. 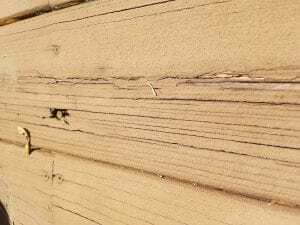 The one thing going I was not told was how to get the old off, had to power wash deck then use a surface cleaner let dry for 48 hours then restain, in less then 6 months same problem has occurred wood is splitting and warping now due to stain not sticking to surface. Worse product I have ever used. Same problem paint bubbled up and peeled after one season…. more work to remove it , its almost worth it to replace the deck boards. This product is no better than the others. It peels off within a year. As a chemical process engineer for years, I have prepared surfaces for aerospace hardware. I know what it takes to coat substrates. I can certainly appreciate following instructions, but this was to no avail. To repair my deck, this time I am going to prime the surfaces and hope that it sticks. Oh the joy of peeing the rest off just to try and get it to stick. I have pictures of the piles of sheets of the coating – it crosslinks to itself just fine but has no adhesive. properties. Looked good the first year. Second year it is bubbling and peeling off in sheets!!! Followed directions to the T!! Went through 3 gallons and purchased another gallon to do the rails this year. if anyone wants to purchase it, it's unopened in my garage. I can't find my receipt so I guess I'm screwed. Wasted alot of my time and having fibromyalgia didn't help. Now I have to figure out how to remove this crap and start over with some stain!!!!! I agree with most complaints here. After 2 years my deck looks like crap. Tried to pressure wash to remove, good luck with that. now I'm stuck between what to do next. Putting my house up for sale soon, I guess I have to repaint and let the next owner deal with the problem. We used restore it 1 year ago. It looked great going down. But now it has become a eye sore. I've not had the peeling issue but it looks awful. There's nothing I have found that cleans it. No matter how much you scrub or power wash it just looks dirty. Mind you I have a complete wrap around porch. So angry with this product and with company's for selling this to people. Sand and scrape is the only way. This stuff should be taken off the market. 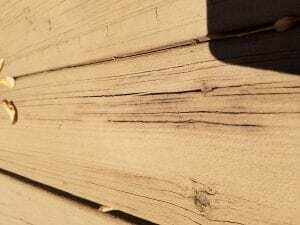 After one year, with careful attention to prep and application directions, the product is peeling off of about half of the deck boards which are pressure treated fir. It seems to be sensitive to the various grain surfaces. I am in a wet climate region and the peeling began in the beginning of the summer season in the year following application. I have used many Olympic products in the past with success, but I would not recommend the use of Rescue It in the Pacific NW. I am not pleased with this products performance. I am a contractor with over 30 years of experience and this product was recommended by one of my vendors, I followed all the manufactures instructions and the used the products the vendor told me to use for cleaning and prepping the surface. We used a surface cleaner and cleaned the deck and let it dry for two weeks before applying the product. Now two years later the product is starting to peel. We applied two coats as recommended. My customer is not pleased! I would suggest using a Sherwin Williams or Benjamin Moore product as opposed to Olympic, Rustoleum, or Behr! Worst product ever. Looked great when we applied it. We followed the directions exactly as far as prep. 6 months later it started to peel. Niw 18 months later we were able to remove 98% with a garden hose. To make it even worse, the last 2 % sticks like crazy glue and we have to use a sander to get it off. Olympic help desk was useless. I am shocked by the negative reviews on this product. I have applied it to the front deck two summers ago and it is still in excellent shape. I have one back deck that I completed last summer and will do the final and very large deck this spring/summer. I am in the process of recommending it to a friend who is a landscaper. I came to this website to double check on the name "Rescue it". I hope it lasts a long time since it sounds like a nightmare to remove, which I do not plan to do before replacing the whole deck many years from now. I live in the foothills area of California; no snow and hot summers which may be a better climate for the product. I was also shocked by these negative comments. Did they apply it properly? I am a big fan of this product. 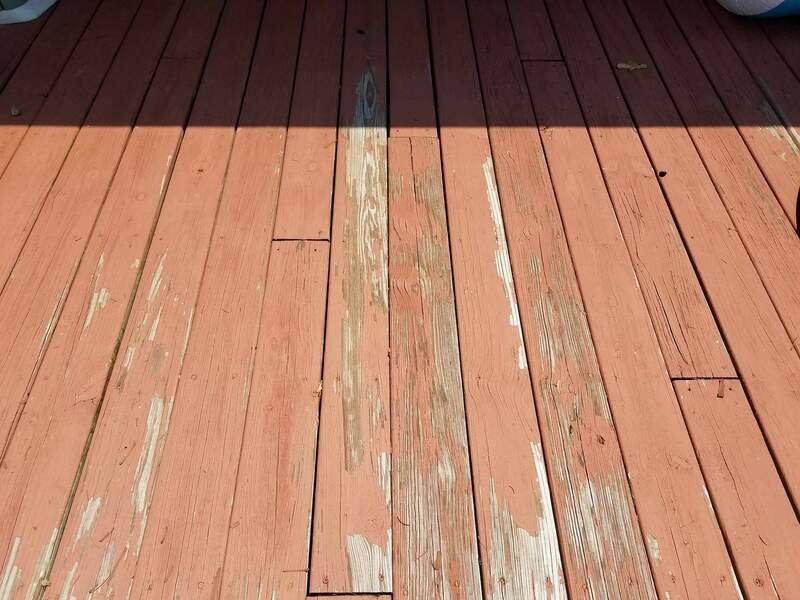 After one winter, the deck looks terrible – much worse than it did 2-years after an application of the stain. could blow small strips off. As the spring progressed the peeling got worst .would not recommend it. It did look great when first done,but that's about all.now I am left with a mess real garbage…. This was the worst product!! We are now into I don't know how many hours of scrapping and sanding our two decks because of the bubbling of the paint. We were told we were only one of many that had this problem. In fact the local paint expert later told us the paint was far too thick to be used on a horizontal surface. We should never have used it on our deck which was interesting since it was publicized as a "Deck Resurfacer." I am disguested! Do you have any product recommendations for removing Rescue It and what to replace it with. I got my money back from PPG but one winter in Iowa and the deck is trashed. You will have to sand or replace the wood. Strippers will not remove the Rescue It fully. Once removed, go with a semi-transparent penetrating stain that can be easily reapplied as needed every 2-3 years. Like others who have commented, the Olympic Rescue It has been a huge disappointment for me. A lot of hard work to apply to my deck and didn't even last one season before starting to peel. I followed instructions. ALL OF THE STATEMENTS BELOW ARE TRUE! We used Rescue-It and followed the directions completely. We had applied the product the end of Summer 2013. Early spring 2014 it was peeling. By the end of summer 2014 our deck looked awful & we didn't know what to do. The stain was literally coming up when we were sitting in a chair & ran our feet over it! Running a light stream from the garden hose would even peel it! We let it go until spring 2015 because we knew we had a lot of work to do. After hours & weekend of scraping, power washing, sanding it still looks bad, but, now we are going to try something else. We contacted Rescue-It company and they requested pictures & paint samples of what had peeled off. We were able to get a refund with a "little" extra to cover the hours of preparation (which could actually never be repaid because we still had work to do to try get it off). The only drawback from that is the requirement of signing a "General Release" that we'd never pursue legal action! Now……I wonder why a company would make a consumer sign something like that–unless they knew it is a lousy product! We wish we had researched this product more! I used the Olympic "Rescue It" on my 15+ year old deck last summer. 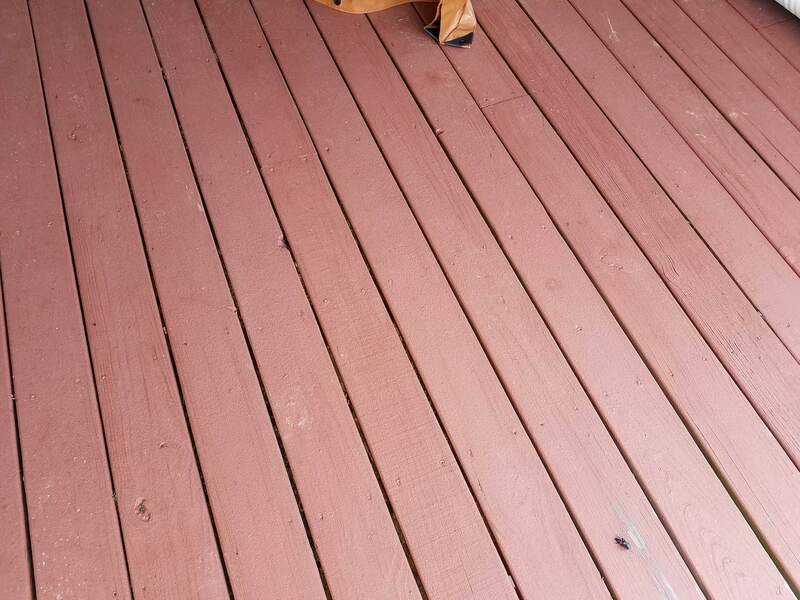 The deck was initially maintained with a variety of different stains/protectors through the years, and none held up to the harsh winters of mountainous northeast PA. Despite the use of these other products, the wood began splitting/cracking in areas. So, I decided to use the Olympic product because it received slightly better reviews than the comparable Rustoleum product. After another harsh winter, I was disappointed to see some peeling, mostly where ice formed on the decking itself. For the most part the railings held up well. So, I did some scraping and repainted the affected areas. Overall, I think the product performed as well as can be expected, given the environmental conditions of my area. I also used on my cement foundation and had no issues of peeling or cracking whatsoever. 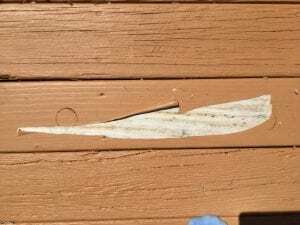 Kohn, Swift & Graf, a Philadelphia-based law firm which handles class action cases nationwide, is investigating claims for a class action law suit against Olympic for its Rescue-it deck paint, which peels and flakes prematurely resulting in costly removal after it starts peeling. Power washing alone won’t get everything, and some people have been forced to actually purchase new boards for their deck. We are gathering information about peoples’ experiences. If you purchased Olympic Rescue-It and had issues with the product, please send your complaints to info@kohnswift.com. All initial consultations are free of charge. We used Rescue It last fall on our front steps. During the winter it started to peel and is looking worse as time goes by. I called customer service 800.441.9695, and was told we could get a refund with a store receipt. He said to power wash the steps then use paint stripper. I can only imagine the total mess we would have if we poured paint stripper on that thick stuff, whatever it is. Please NEVER use Rescue It on anything!!! Olympic Rescue began to peel after the winter. Called company sent me a check to cover the cost of paint after I sent them my pictures. Told me to power wash the deck to get the peeled paint off. Power washed for several hours then rented a large industrial sander. This did not work only took off the paint where it was partially peeling which is about 50% of the deck. I am a total loss. Have not cashed the check. I need all of the boards replaced. What a terrible product. Help!!! I used Rescue it last summer and my deck this year has peeled so bad it is a mess.I sent photos to Olympic June 8,2015 and have not gotten a reply.I was going to post the pictures on social media if I didn't hear anything but I guess after seeing this site they wouldn't care .What a waste of time and money. Agree that you shouldn't waste your money or your time. Looked awesome after applying. Then Spring came and it all bubbled up and is still peeling off. Most of it is gone. Do not waste your money on this product. Painted my deck last summeras instructed on can and it started coming off that same winter. Don't do it. This has to be the worst deck product ever. Ours lasted all of 7 months, now even more work ensues because of using it. It's peeled everywhere, we drag strips of this junk through our house on our shoes. Wish we had never heard of it, please don't fall for this product. My deck is a disaster …. Put the Olympia Rescue product on last spring, looked great for the summer and now I can peel it off with my foot! I will never use an Olympia product again . . .
Olympic rescue it is awful- peeled the winter after, but not completely, I have 40 hrs in pressure washing and my wedding cake stairs look like crap- they offer a 150.00 no question asked, no receipt, nothing-except they want us to sign a contract saying we will not sue them- I know their is a lawsuit against Behr, anybody know if there is one against Oylmpic?? Olympic Rescue It did not work. Applied spring of last year and majority already lifted and peeled off by April this year. Now deck looks like trash. Now we must find another way and after spending so much money, we feel we should receive some sort of compensation. i was very hopeful when using this product . I used the light restoration, as my deck was in pretty good shape. I carefully did all prep work required. Looked wonderful when completed . i waited 72 hrs before using the deck, as required. but unfortunately every place my dog went left scratches! After a couple weeks, it still continues to scratch. I feel sick. It looks terrible. I contacted Olympic and had some back and forth communication, with no resolve. If you have animals do NOT USE THIS PRODUCT! 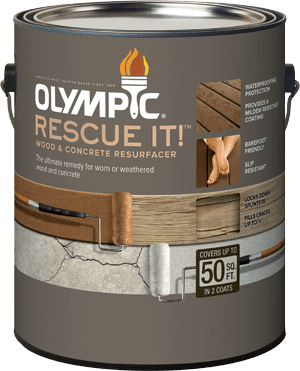 Olympic rescue it is the sorriest product I've seen , totally ruined my deck and now we're gonna have to try and fix it. 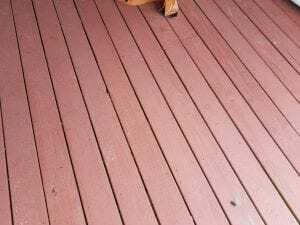 Our deck looks like crap and I wouldn't suggest anyone buy this product !!! The product peeled the winter after application despite thoroughly following the directions. My deck needs to be completely redone. 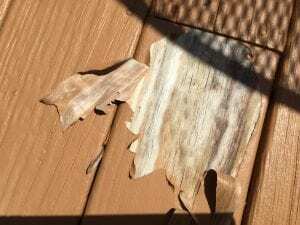 Olympic deck restore is the worst product that lowes sells for decks after just one year it all peeled off even using the restore deck wash with it, if you use this product your are asking for more problems, they should remove this stuff from there shelves. Unfortunately after the first winter, we are noticing many chipped areas where the "Rescue It" has come off. We cannot attribute this to wear and tear or use. Now we are faced with what to do. Do we try to strip the product off the remainder of the deck (almost 400 square feet)? Do we reapply in the chipped areas? Do we sand it down and then strip or reapply? Honestly, do not use any of these products. You will be disappointed. I just wish we could get our money back!! You will not be able to strip it off. Sanding is the only way and that is very hard to do as well. Would not reapply either as it will repeat the problem. This sounds bad but it might be best to replace the wood with new wood. We feel bad for consumers that have been sold on the false claims this product has made. Loved the product until the next spring. Was using my battery powered leaf blower to move leaves off the deck and Rescue It started flying off the deck. Couldn't believe it. The deck section under my roof is fine, the exposed section will have to be redone. My question is, where do I got from here? I can't take it off all the deck, spindles, etc. Do I just keep putting this awful product down in the exposed deck every spring? It will just continue to fail every Spring and will most likely get worse. At least sand it off the floor if you can. 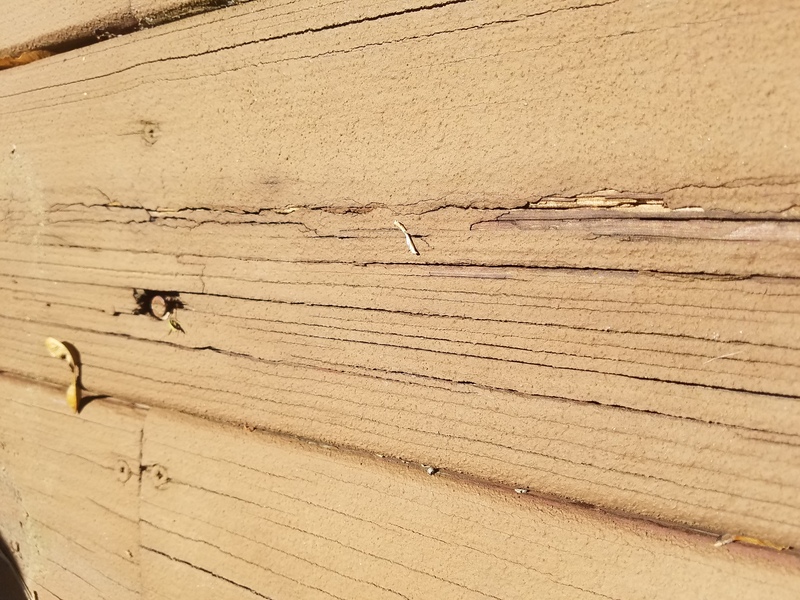 We have a wooden deck that was showing wear and rather than replacing the deck we wanted to find a way to extend its life. After researching various products and options we decided to go with Olympic’s Rescue It. My wife and I subsequently purchased from our local Lowe’s Home Improvement Store 6 gallons (2, 3-gallon containers at a price of $99.98 each) of Rescue It at a cost of $199.96 + $12.00 (sales tax), totaling $211.96. Prior to applying the Rescue It, we consulted with not only the Lowe’s paint department representative but also the directions on the label of the paint can. We followed the instructions correctly on preparing the deck prior to applying the paint. On May 25, 2014, we sealed our deck with the first coat of Rescue It. We then waited 24 hours and applied a second coat of Rescue It on May 26, 2014. The finished product held up fine throughout the remainder of the summer and fall. It wasn’t until winter that we noticed some of the paint starting to come off. As winter went along, more and more of the paint began peeling off with only the help of the wind. Our yard became littered with strips of the Rescue It, some as long as 12 inches in length. CURRENTLY: HAVE BEEN ON HOLD FOR OLYMPIC LINE TO SPEAK TO A HUMAN BEING AND GET AN E-MAIL ADDRESS TO SEND E-MAIL WITH PICTURES FOR 20 MINUTES ALREADY!! Same here! Exactly… purchased at Lowe's – 2 3 gallons. Did just what you have listed… it looks worse now than it did before we even started! The entire deck needs to be done again. We purchased in May 2014… here we are May 2015.